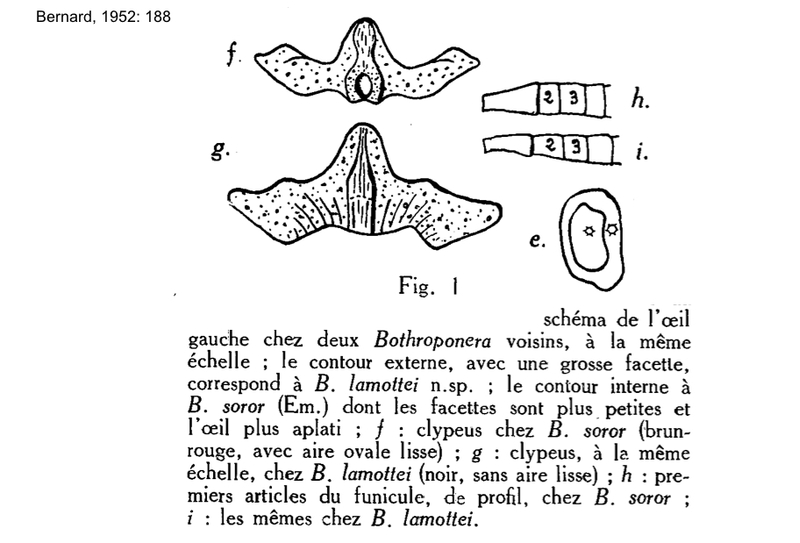 Type location Guinea (Bothroponera lamottei, Bernard, 1952: 188, worker), Mt. Nimba, collector Lamotte; worker only described - no images on Antweb (June 2014). Bolton (1995, 306) has "Combination in Pachycondyla: Brown, new combination"; status revived Schmidt & Shattuck, 2014: 77 . General colour and form similar to soror (silvestrii) but head differs. Colour matt black, without bronze reflections. Head and body finely shagreened, somewhat more than soror, especially on the pronotum. Fairly dense, yellow pilosity. Head manifestly bigger and more rounded relative to the body, with sides converging posterior to the eyes. Eye with 180 facets (ommatidia). Clypeus dull black, partly with longitudinal striations, medial lobe convex, but lateral lobes more pronounced. Propodeum of lamottei and soror with a sharp angle at posterior declivity (rounded transition in other former Bothroponera). Hemispherical petiole, a little wider than long. From Guinea a total of 11 workers were collected by Lamotte from forest locations - Yanlé 2; Yalanzou, 2; Camp IV, 1000 m, 3; Nion, 3; Mount Tô, 1; plus, 1 worker from the crest of Mount Tô which was smaller, TL 7.2, and blacker (Bernard, 1952). One is shown right (scan from photocopy of photo).